This article is about the elections held in 1922 for Pennsylvania's Class 1 Senate seat. For the special election also held that year for Pennsylvania's Class 3 Senate seat, see United States Senate special election in Pennsylvania, 1922. *Note: This map and the results above are representative of the regular general election, not the special election, the results of which may be found to the left. 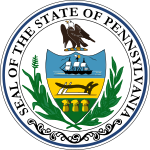 The 1922 United States Senate election in Pennsylvania was held on November 7, 1922. Incumbent Republican U.S. Senator David A. Reed, who was appointed in August 1922 to fill the vacancy created by the death of William E. Crow, was elected both to complete the remainder of Crow's term, ending in March 1923, and to a full six-year term in his own right, beginning upon the expiration of Crow's term. *Note: A special election was held on the same day as the general election to elect a candidate to complete the remainder of Crow's term. †Note: These are the results of the regularly scheduled general election for the term beginning upon the expiration of Crow's term in March 1923. ^ a b c "REED, David Aiken, (1880 - 1953)". Biographical Directory of the U.S. Congress. Retrieved July 5, 2012. ^ a b "Statistics of the Congressional Election of November 7, 1922" (PDF). Office of the Clerk of the U.S. House. Retrieved July 9, 2014.